How to Achieve Financial Freedom Investing in Stock Market? Everyone wants to be financially free and independent but let us understand what financial freedom means and how can one achieve financial freedom in the true sense with equity investments in India. So what Financial Freedom means in its true sense? If your monthly expense is less than or equal to the passive income generated from your investments, you have achieved financial freedom with investments. Passive income is not limited to above only and can be something else as well. An example of passive income can be a business partnership where you have shared profits passively and with no active involvement in the business on a day to day basis. Once you have a financial freedom, the active income or the work done by the individual adds to the overall income but it is because of a choice and not because of a need. So how can one achieve financial freedom? Financial freedom may sound like a tough roadmap but it isn’t if you work towards it with the right approach. The best way to achieve financial freedom is through investments and let me share with you some simple changes you may need to do to achieve financial freedom. If you are considering to invest 5k Rs per month and want to achieve financial freedom, you will need lot more time than investing 10k per month. There is no rocket science in it. So if you can get a better salary or make an improvement in your business so that you can increase your income, do it. If there isn’t that you can do right away, do it over a period of time but keep an ongoing focus in the back of your mind to increase your overall income. If there is anything that you can do or learn on the sideline like may be work over weekends or learn something new to make an income on the sideline. Do it. Anything that can help you increase your income is the first step towards becoming financial freedom. 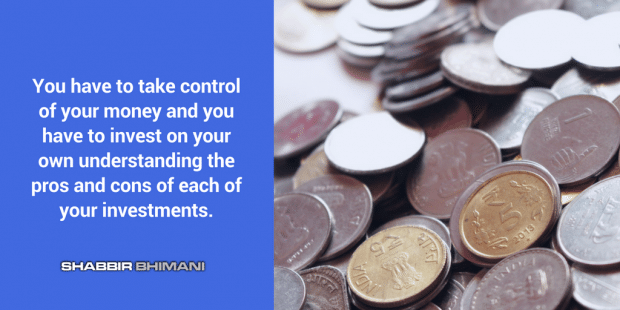 Tons of website speak about financial freedom and each one will have a point that says control your expense to achieve financial freedom and it may sound true that one should control expenses but it isn’t practical. We Indians aren’t spenders by nature but have a tendency towards saving more than spending. So instead of making a behavioral change from spenders to savers, we have to make sure we are investing in such a manner that it increases the monthly cash flow. If you have a lump sum amount and are planning to invest in a mutual fund, invest in a fund that pays dividend more regularly than the one that doesn’t because it can increase your monthly cash flow of dividend from mutual funds. Once you have higher cash flow, you can invest the surplus cash on a regular and more consistent basis towards your financial freedom. As an individual one can work a limited amount of time and can generate a limited amount of money but if the same individual allows its money to work for him, the effect is compounding. When you start as a fresher from the college, your real capital is only you as an individual working for your financial freedom. But as you grow, your real capital increases with your investments. Slowly over time, your investments should be making more money than you and this is when you become a financially independent person. Let us take an example of an individual who makes an income of 20k per month. Just for the calculation sake, he will continue to make 20k for the next 10 years. Out of 20k, he manages to invest 5k per month. At 12% return, his corpus will be 11.5L after 10 years. He is still making ₹20k as an individual but his actual income will be his income of ₹20k from his salary and ₹11k from the corpus. Without any growth in his individual income, he is still making 50% more in absolute terms to what he was making 10 years ago and so his real capital has grown by 50%. Financial discussions tend to make the environment damn serious. Have you ever made a lighter discussion about investment with your dad? You don’t need to be right.Try and avoid making every financial investment a serious discussion and focus on making it interesting and fun to understand and learn. I am no investment advisor and have no plans to be one either. I am more of an equity investor and blog more as a hobby of how, where and why I invest. Being a blogger in the finance niche there are questions and queries directed towards me about invest advisory and I take it with the element of fun where I often reply that I have left such advisory services to the experts on the TV channels. If you aren’t able to add the element of enjoyment to your investments, you won’t love it and this is when it becomes more of a burden to achieve financial freedom. There is no one on this planet apart from your close family that can help you make money from the stock market. If you are trying to find such person, you are doing it on the wrong planet. On Mars, you may still find someone but definitely not on the planet earth (adding fun part right away). You have to take control of your money and you have to invest on your own understanding the pros and cons of each of your investments. If you don’t want to be doing all your research and stock picking, let mutual funds do it for you and there is no third option. If you want someone will help you make money from the stock market providing you with tips for a fee, that is a tough business model to understand. If you have any kind of debt, you should always invest in your debt first. No one can achieve financial freedom with debts and avoid playing the interest rate number game. Pay 10% EMI and get 12% return from investing to keep the difference but those looks good on percentage terms but in absolute terms, they will not make any significant amount. It is always better to have more peace of mind and debt free than anything else. A home loan if you pay Rs 1000 more than your allocated EMI, it can take you long way over time. So if you have a loan and are considering investing, you are making a wrong choice. A loan is the first thing you should invest all your time and effort into. If you aren’t investing fully to save tax, you are paying much more to the taxman than you should be and this does mean you are reducing your monthly cash flow. Any individual who can save tax by investing in tax saving schemes should always consider investing for saving tax. Consider tax as an expense and if you can reduce your expense, it is always a better choice of making a move towards financial freedom. Some people argue when the tax bracket is low, they prefer to pay the tax than to do tax saving investments and it may sound good for argument but the counter argument is one should start investing early. Equity investors are distracted by many factors like high market valuations, RBI policies and fed rate hikes, monsoon, budget or even a tweet from Mr. Donald Trump. To be very honest I never give a damn to them and not because I don’t want to but because at times I don’t see them any relevance to the market and then there isn’t a considerable impact on the market in the long run. As an investor, one must focus on the ultimate goal of your investment. If you are picking the right stocks at the right price that offer value and can hold them for the right time everything else about the market as a whole will be immaterial. Everyone wants a well-diversified portfolio and a diversified portfolio has its own cons but when it comes to income diversification, you should always consider having more than one source income for sure. If you are the only person making an income, consider a scenario when you are hit with an accident and have to take a long unpaid leave? Creating multiple income sources is always a good choice for better financial stability and ultimately achieving financial freedom. Once you achieve financial freedom, it doesn’t mean you have to take a retirement. It means you can try things that you thought weren’t possible otherwise. You are here: Home / Finance Planning / How to Achieve Financial Freedom Investing in Stock Market?